Greetings from The 88 Project! We are bringing you news, analysis, and actions regarding human rights and civil society in Vietnam during the week of February 4-10. Activist Chau Van Kham’s wife published an open letter this week officially confirming his arrest in Vietnam after he traveled there for a “fact-finding” mission. Michael Nguyen’s wife went to Washington DC to lobby for his release from prison after Nguyen, a US citizen, was detained eight months ago while on a trip to visit family in Vietnam. This week, we remember the trials of environmental and labor rights activist Hoang Duc Binh, Binh’s driver Nguyen Nam Phong, and six Hoa Hao Buddhists, on their one-year anniversaries, as well as the arrest of Nguyen Van Truong. Truong posted content online that was critical of the state; he remains in incommunicado detention a year after his arrest. Meanwhile, blogger and former political prisoner Truong Duy Nhat is still missing over two weeks after he was last seen in Thailand, and some now fear that he has been abducted by Vietnamese agents. Vietnam once again has been classified as “Not Free” by Freedom House in its annual report, “Freedom in the World.” And in news and analysis, read about the preservation of the ethnic minority Hmong culture in Vietnam, as well as commentary on labor rights in Vietnam and on the complicated line in Asia between filtering out fake news and restricting free speech. In case you missed it, five people have been arrested in Vietnam for activism in less than one month; two other activists are currently missing. If you’d like to support these or other activists at risk and political prisoners, please consider donating to the Conscience Fund, run by Dr. Nguyen Quang A.
Chau Van Kham‘s wife wrote an open letter published on February 4, 2019, in which she confirmed that her husband was arrested on January 13, 2019, and is currently under investigation for “violating Vietnamese law.” The Australian Embassy has been informed of his arrest, but the exact charges against him are still unknown. Kham, an Australian citizen and member of Viet Tan, and Nguyen Van Vien, a member of the Brotherhood for Democracy, were both arrested in Ho Chi Minh City. According to a press release from the Brotherhood for Democracy, police arrested Vien when he was on the way to pick up Kham, who was in Vietnam for a “fact-finding” mission after crossing the land border with Cambodia. Detained US citizen Michael Nguyen‘s wife, Helen Nguyen, attended the US’s State of the Union address this week, invited by Rep. Katie Porter of California. She was also able to meet with House Speaker Nancy Pelosi and Rep. Eliot Engel of New York and is optimistic that her advocacy for her husband’s freedom will travel with US President Trump when he visits Vietnam later this month. Michael Nguyen, a US citizen of Vietnamese descent, has been detained in Vietnam since July 2018, while he was on a trip to visit family. He is still being held without formal charges, but he is under investigation for subversion under Article 109 of Vietnam’s 2015 Criminal Code. Ms. Nguyen reported that contact with her husband has been severely restricted, with a US consular official only allowed to visit him for short periods once every month. Neither the family, nor lawyers, have been permitted access. Per the most recent consular visit on January 30, Mr. Nguyen is doing well overall in prison, with only minor health issues. His family maintains he has not participated in any activism activities and Mrs. Nguyen said that he had visited Vietnam without issues for many years prior to his arrest. Phan Kim Khanh‘s family and fellow activists visited him in prison on February 10, and reported that he is in good health and spirits. Khanh is still trying to appeal his sentence but the People’s Court of Thai Nguyen province has not taken his appeal petition. Phan Kim Khanh was arrested on March 21, 2017 under Article 88 for “propaganda against the Socialist state.” On October 25, 2017, Khanh was convicted in a four-hour trial of violating Article 88 and sentenced to six years in prison and four years of house arrest. This week, we remember Hoang Duc Binh (left) and Nguyen Nam Phong (right), who were sentenced to 14 and two years in prison, respectively, by a court in Nghe An Province on February 6, 2018. Binh is the Vice President of the Viet Labour Movement, a blogger, and an activist who helped fishermen affected by the 2016 Formosa environmental disaster. He has been in poor health in prison. Nguyen Nam Phong was driving Binh and a priest in May 2017 when authorities stopped their car to arrest Binh; Phong refused to open the car door. While in prison, Phong has been beaten harshly by officers there. We also remember six Hoa Hao Buddhists — Bui Van Trung, Bui Van Tham, Nguyen Hoang Nam, Le Thi Hong Hanh, Bui Thi Bich Tuyen, and Le Thi Hen (not pictured) — who were tried in An Giang Province on February 9, 2018. Bui Van Tham was charged under Article 257 of the 1999 Criminal Code (“resisting persons in the performance of their official duties”) and Article 245 (“causing public disorder”), while the other five were charged under Article 245. 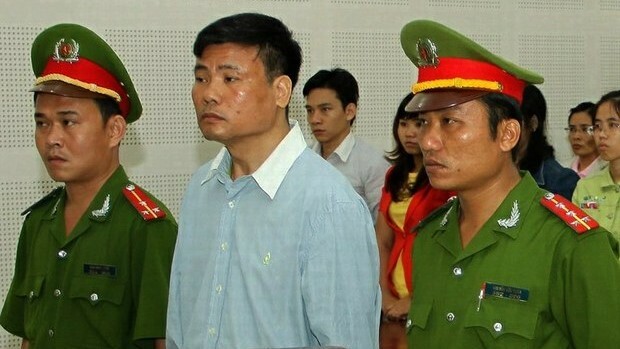 Trung and Tham were sentenced to six years in prison; Nam was sentenced to four; Hanh and Tuyen were sentenced to three; and Hen was given a two-year suspended sentence. While authorities charged the six for a causing a traffic jam, many believe this is actually a case of religious repression against the disciples who had gathered for the commemoration of the death of Bui Van Trung’s mother. On February 9, 2018, Nguyen Van Truong was arrested in Thai Nguyen Province under Article 331 of the 2015 Criminal Code (“abusing democratic freedoms”) for his online postings about police corruption. He still awaits trial in incommunicado detention a year after his initial arrest. Former political prisoner and Radio Free Asia blogger Truong Duy Nhat has been missing since January 26, a day after he attempted to claim asylum status in Thailand after fleeing Vietnam in the weeks prior. Some sources say he was abducted from a popular mall in Bangkok. Nhat was arrested in 2013 in Vietnam and later sentenced to two years in prison for his blog, “Another Point of View,” which contained content critical of the government. Nhat allegedly left Vietnam for Thailand after he found out that he faced risk of re-arrest. Some say Nhat potentially had information that could be damaging to the Vietnamese Prime Minister and now fear that Nhat was abducted by Vietnamese agents. Thai officials say they do not have a record of Nhat’s entry into the country but are now investigating his disappearance. The US supports the investigation. Both Reporters Without Borders and the Committee to Protect Journalists have called for immediate investigation into Nhat’s disappearance. Vietnam has been classified as “Not Free” in Freedom House’s Freedom in the World 2019 report, which measures civic and political freedoms. Vietnam is one of 58 global countries and territories given the designation. Vietnam’s aggregate score is 20/100 (with 100 being the most free), with a sub-score of 7/7 for political rights and 5/7 for civil liberties (with 7 being the least free).